Well this is the last saltwater report for 2018 and all in all it was a good year. I think in the New Year I will do a review of the season and bring to light some of the issues we will be facing in 2019. For now though, lets talk about winter fishing. We were out quite a bit this past week, on charters as well as personal fishing. I would classify the fishing as consistent. 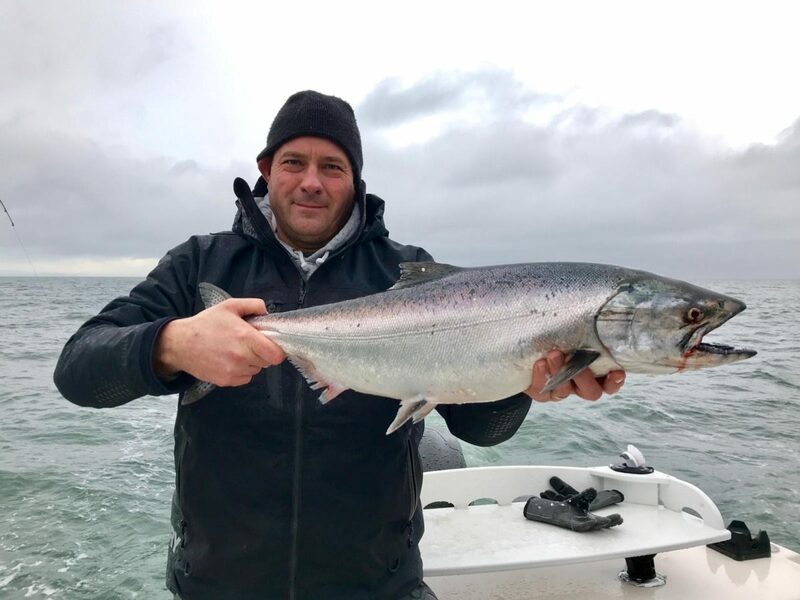 There are fish in all the popular spots, and if you put your time in you are going to get rewarded with your shots at some nice winter chinook. If I had to pick a spot that stood out this past week, it would be Vancouver Harbour, aka Burrard Inlet. There are definitely some fish around the Bell Buoy, Mile Markers, and Freighters in 120-160 feet of water. Fish have also been taken around the QB and in towards the Cap Mouth on the flood. There are some nice bait balls and if you find the bait you find the fish, no secret there. Greg holding up a nice fish from the Harbour this week. The stomach contents of a chinook from the Bell Buoy this week. One of the herring is so fresh it looks like it was eaten just minutes before. You want to keep your gear pretty close to the bottom but keep your eyes on the sonar as well, we did mark some suspended fish. A chinook about 135 down in 152 feet of water just out from the Bell. Hooked up in the Harbour! The brighter gear seems to be working well still. Chartreuse and green blade flashers have been productive; the Gibbs Lemon Lime has been really good this week. Chartreuse and green spoons with glow on them have also been good in the 3.0 and 3.5 sizes in G-Force and Kingfisher. Irish Cream, Homeland, Outfitter, and Trailhead have been working well. We have been dropping some test traps for crab and the results have been very lack luster. I haven’t seen the crabbing this dismal in awhile; I think they got hit pretty hard this year. Fortunately the prawning has been good. I had one of my best sets in some time yesterday. Some jumbo BC spot prawns from Wednesdays trip! See you in the shop or on the water. Happy New Year!